Many studies on animal behavior include the investigation of social behavior. Noldus offers two software packages designed to help you gain insight into animal social behavior: The Observer® XT allows you to code and analyze this behavior in great detail whereas TrackLab allows you to follow spatial behavior of the animals automatically. With over 28 years of experience in designing the perfect solution for researchers in many different research fields, we look forward to working with you on your ideal set-up! Understanding social behavior is becoming increasingly important in farm animal husbandry as more animals are housed in groups rather than in individual stables or pens. Social behavior is an important indicator of welfare, and it is highly influenced by housing conditions. Of course, social behavior is studied in more contexts than just this, such as the investigation of problem behavior in dogs, or the implications of adding new group members to an established group of chimpanzees. The Observer XT - the gold standard in behavioral coding software. TrackLab - gain insights into multiple animals’ spatial behavior and social dynamics. Social behavior and especially hierarchies can be very important for the health, welfare, and production of farm animals. Using Ultra-wideband (UWB) tracking technology, TrackLab lets you import accurate and reliable tracking data offline or in real-time. It is possible to monitor user-defined zones for activity and design algorithms to detect and classify key behavioral indicators. The collected data can be visualized, processed, and analyzed. A cow wearing an ubisense tag attached to a neck collar. Tags and collars can be adjusted, contact us for detailed information! We recently installed TrackLab at Aberystwyth University in Wales, UK, for the tracking and detailed analysis of the spatial behavior of sheep. Read more in this blog post. The Flanders Research Institute for Agriculture, Fisheries and Food (ILVO) in Belgium concludes in their study that TrackLab is a reliable tool for research on spatial behavior in real-world environment studies. Read this blog post to learn more! The kind of set-up you need depends on your research aims and environment; you might choose to use a handheld for on-the-go scoring, or set up a stationary post. The same goes for the methods of observation. 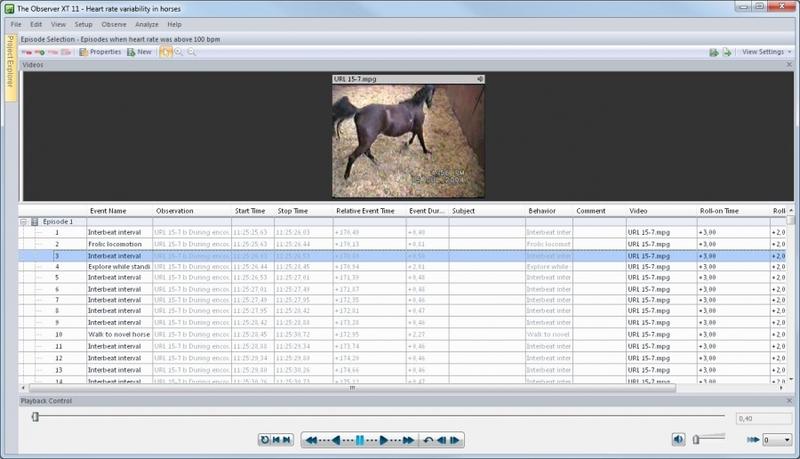 You can score live, offline from video files, or combine methods; you can use continuous and/or instantaneous scoring. The Observer XT is powerful, versatile, flexible,and adaptable to become your ideal coding tool. With Observer XT you can add as little or as much detail to your ethogram as you see fit. Behaviors are then easily scored by clicking them or using shortkeys. The coding scheme (ethogram) is your starting point for the collection of data that contains exactly the amount of detail you need. In social interaction studies, it is interesting to know which social behavior was directed towards which conspecific, or even to which body part of that conspecific. When investigating social interaction in chickens, the behavior ‘peck group member’ can be extended with the modifier ‘body part’ and modifier values ‘head’, ‘neck’, ‘tail’, and ‘body’. Once all your data is collected, you can analyze the relation between different behaviors to get great insight into the structure of behavior. The Observer XT Advanced Analysis Module enables lag sequential analysis; the analysis of time and state lags between specific behaviors. You can investigate how long it takes for a certain behavior to be repeated, or how much time passes before one behavior is followed by another. For instance: “What is the average amount of time between an aggressive display and a biting event?" The analysis of intra and inter individual time and event lags allows you to investigate hierarchies and social structures. Think of research questions related to group departure behavior in herds (such as sheep and geese), feeding order in a group of predator species, and more. Find out more about social behavior research in these blog posts.